#17: First we would like to apologize due to some editing issues. The program that was used to record the episode had been having issues with Audio Drift. This episode, The editing took days. Thank you Shannon. THIS WHOLE EPISODE IS SPOILERS!!!!! SPOILERS!!! SPOILERS!!!! Lea and Kat gush about their love of the new Black Panther Movie, as well as favorite characters and why. Kat attempts to discuss some of the familial views that are introduced in the movie but due to the love of this movie and need to just discuss what their favorite scenes are. I apologize for saying T’Challa’s name incorrectly. 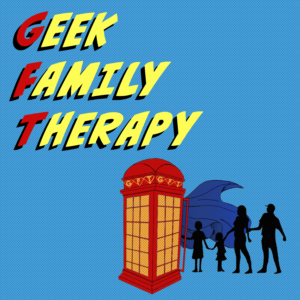 Follow GFT on twitter @geekfamtherapy and let us know what you think about the show or what you would like us to talk about. Don’t forget to subscribe where ever you hear our podcast and please leave a review! #16: Robots are being introduced into mainstream more often. We have Alexa, and google home, not to mention Siri on iPhones. Now there is the introduction to Jibo for the home that can display emotions and learns what different users in the home will like and responds accordingly.